1. Earnings blitz: Another big day for earnings season is well underway. Sony (SNE), BP (BP) and Shell (RDSB) have reported numbers. Coach (COH), Pfizer (PFE), Kellogg (K) and Molson Coors (TAP) are also announcing results before the opening bell. Then Electronic Arts (EA), Gilead Sciences (GILD), Sturm Ruger (RGR), Square (SQ), Denny's (DENN), DeVry Education (DV), Papa John's (PZZA) and U.S. Steel (X) are releasing earnings after the close. 2. Fasten your seatbelts: Major auto manufacturers, including GM (GM) and Ford (F), are releasing October U.S. auto sales numbers throughout the day on Tuesday. Analysts expect sales continued to slow last month. One of the headwinds for sales right now is the rising price of new cars. Sales in the first nine months of 2016 were essentially unchanged from last year, following years of gains. 3. Central banks in the spotlight: Economists and traders are monitoring a bunch of central bank moves this week. Both the Bank of Japan and the Reserve Bank of Australia decided to leave interest rates unchanged on Tuesday. The Bank of England had more of a surprise for markets when it announced late Monday that its governor, Mark Carney, would stay in his role until 2019 to ensure stability as Britain negotiates its exit from the European Union. Investors had been hoping he would stay until 2021 to provide a steady hand to guide the economy. 4. What's up with China? The latest data measuring the health of China's manufacturing industry showed a surge in growth during October. "The caveat is that the strength remains primarily driven by more rapid credit growth and is unlikely to be sustained," said Julian Evans-Pritchard, a China economist at Capital Economics. 5. 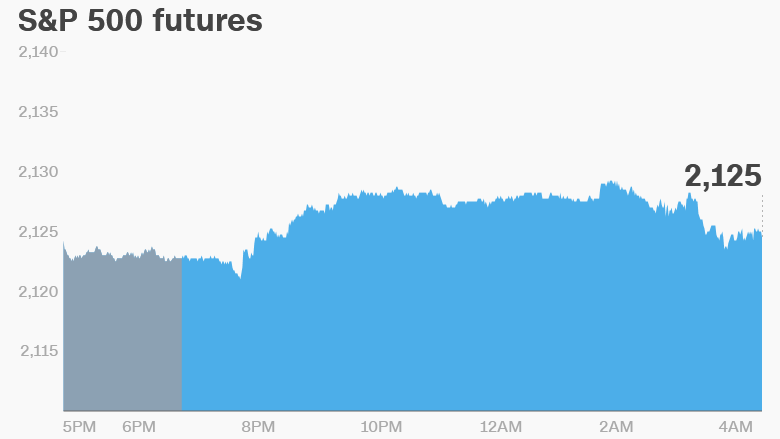 Global market overview: U.S. stock futures are holding steady right now. But global markets show a mixed picture. European markets are bumping between small gains and losses in early trading. Major Asian markets ended with mixed results. 6. Stock to watch -- Yum China: Trading in Yum China is set to begin on the New York Stock Exchange on Tuesday. The company operates chains like KFC and Pizza Hut in mainland China, licensing them from Yum Brands (YUM).